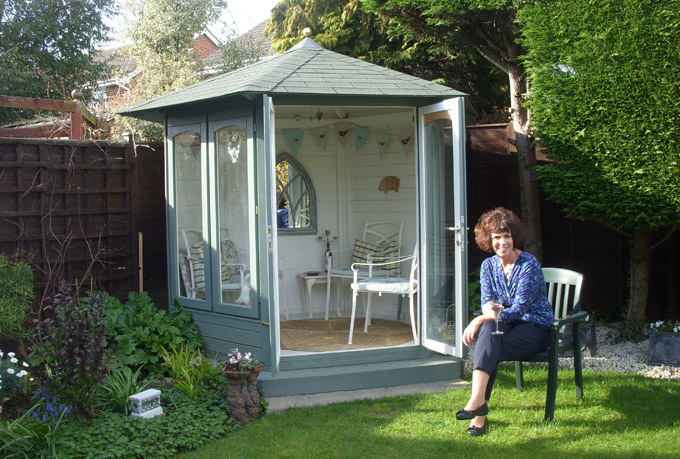 This case study focuses on Jan Price and her summerhouse project. 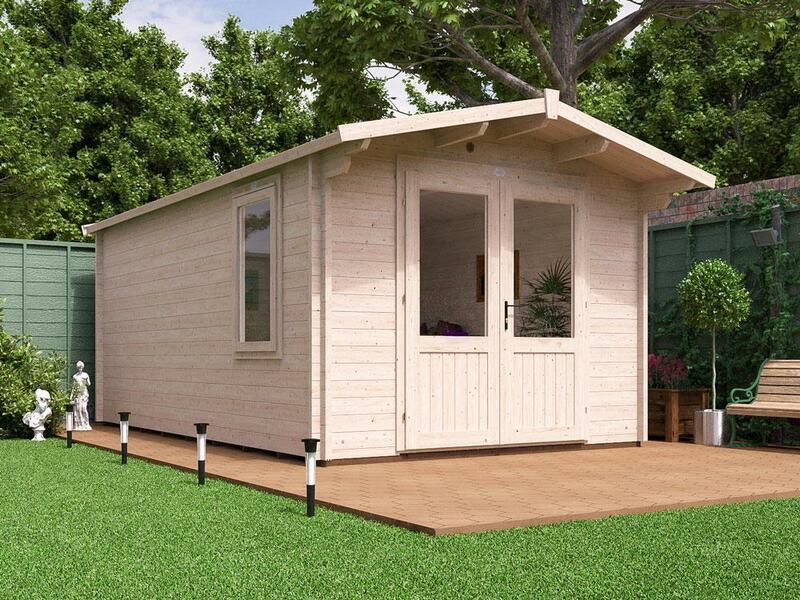 As an art teacher, Jan appreciates the beautiful things in life, and craved an attractive replacement for a rather ugly old shed. 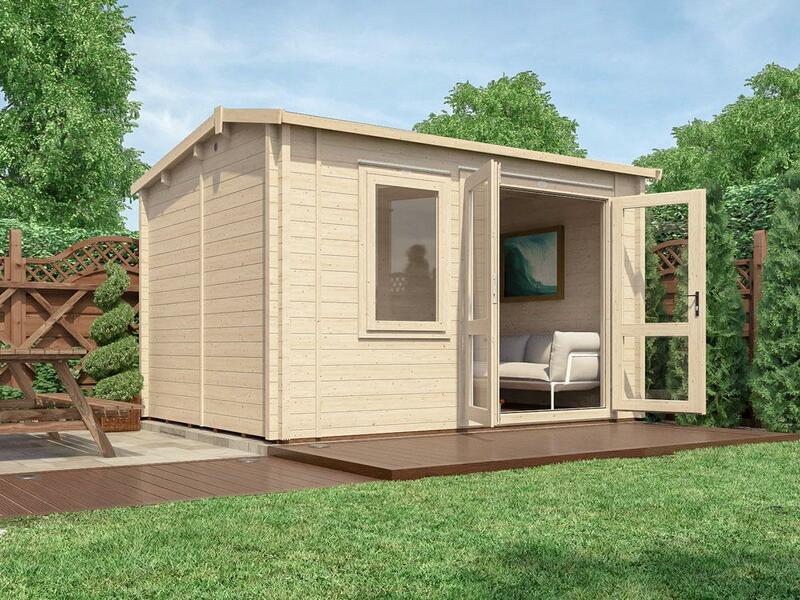 Here's the story of how Jan created her perfect space from our Summerhouse Vantage 250. 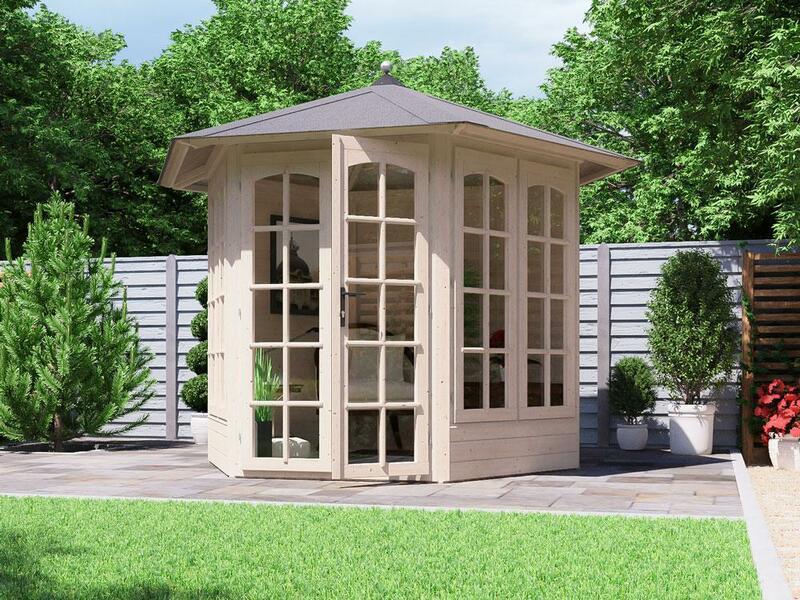 Jan's main motivation for purchasing a summerhouse was the desire for a quiet and beautiful escape, which would complement her existing garden. "The main reason (for the purchase) was that I wanted something beautiful to look at when I looked out of the window! I also wanted somewhere quiet to sit, which was away from the house." 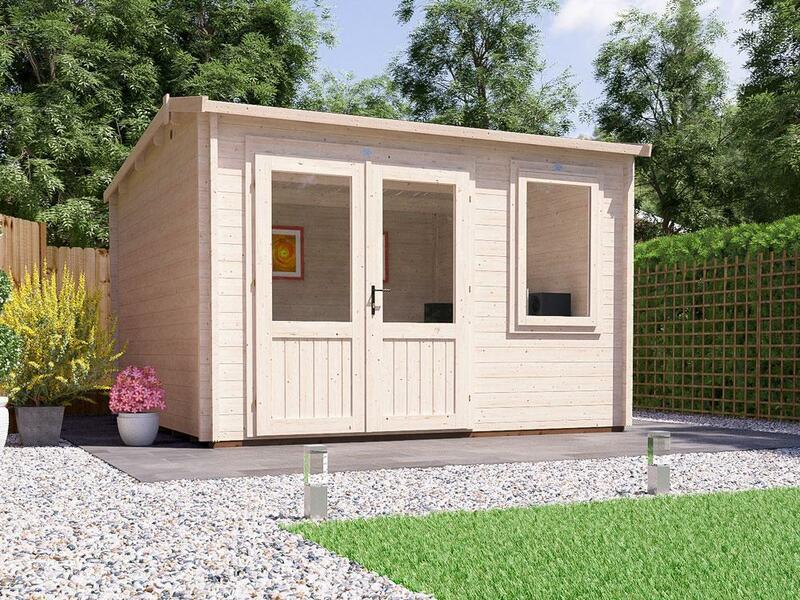 However, Jan was also keen to replace her current garden shed, which was blighting the appearance of her outdoor space. 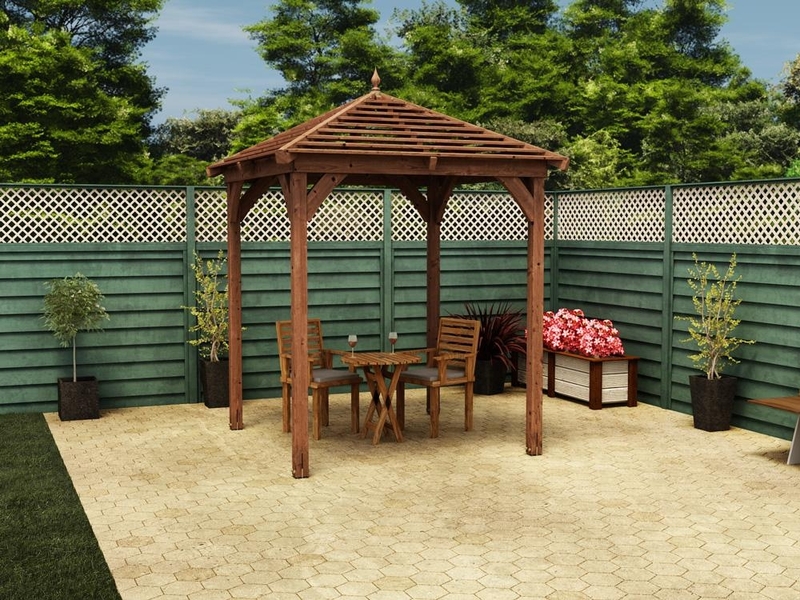 "We only have a small garden, which was dominated in one corner by a large brown shed. 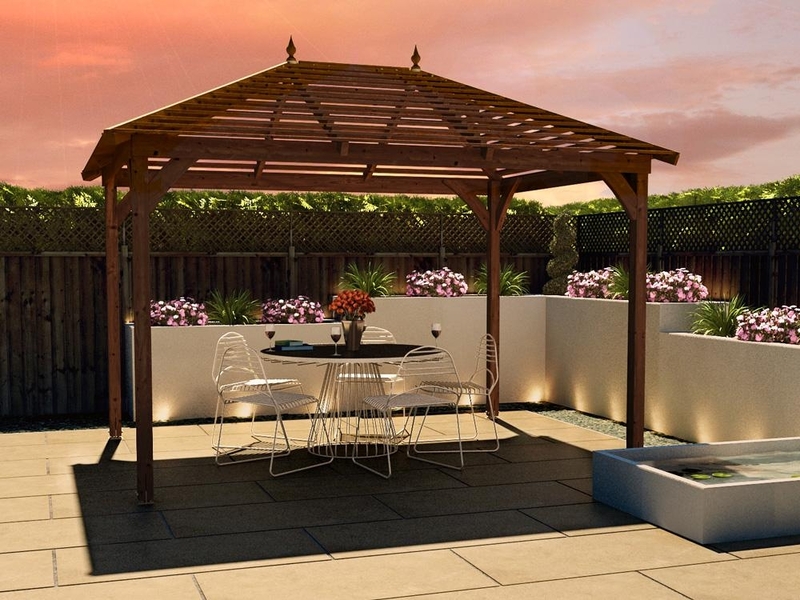 This was perfectly serviceable, housing all the garden paraphernalia such as lawn-mower, tools and sunbeds, but it just looked so ugly and didn't complement my plants at all. 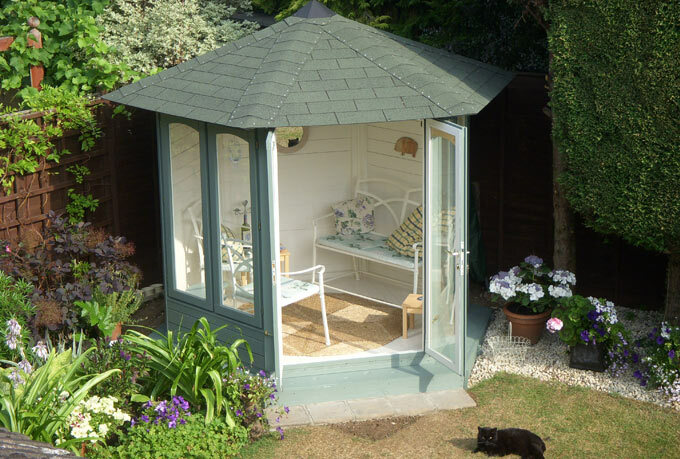 "For a while I had a vison of a hexagonal summerhouse as a focal point, which would both enhance the garden's appearance, whilst at the same time being a useful, functional space, which could be enjoyed by family and friends. (Since the summerhouse's arrival, I'm afraid the garden stuff has now been consigned to the garage!)" Jan had a clear vision in her mind of the type of garden building she wanted. 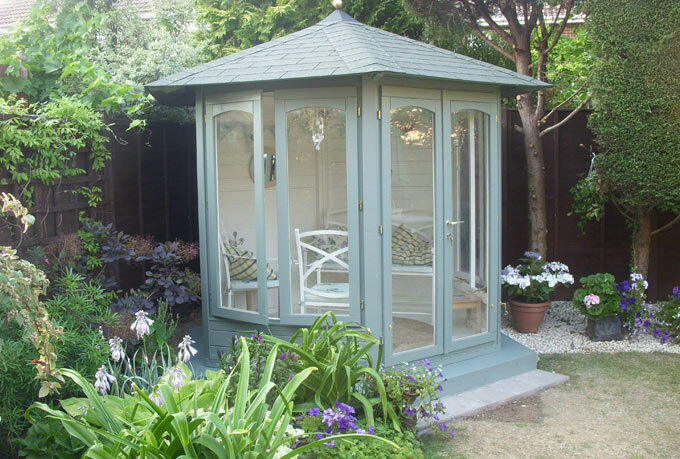 "I definitely wanted a hexagonal summerhouse, which would blend in with and enhance the garden." 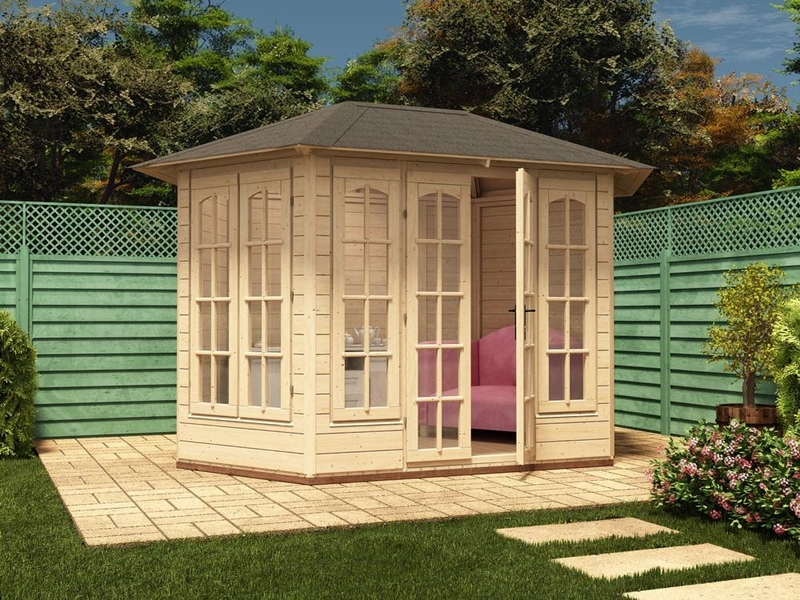 However, it was a Dunster House summerhouse which finally won her heart. 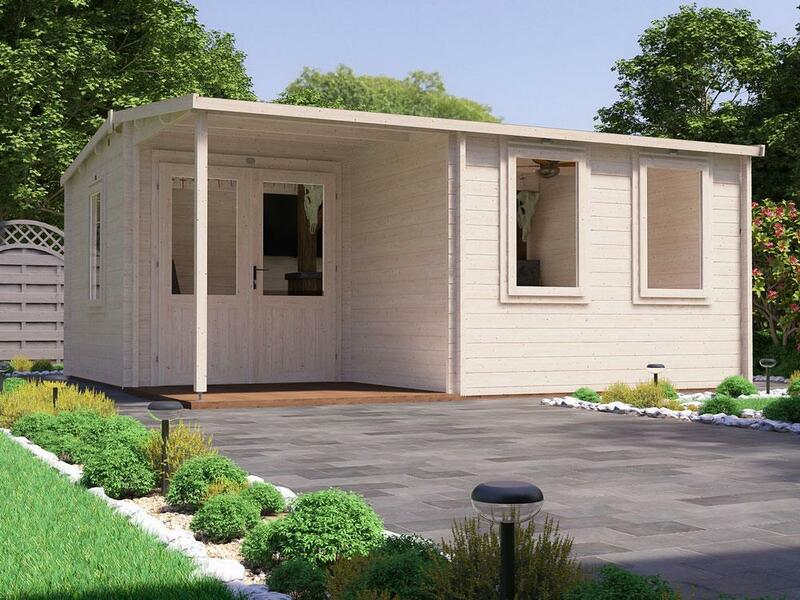 "It was initially the design, then definitely the reasonable price," said Jan about her reasons for purchasing the summerhouse. "I wanted a hexagonal shape and looked at many other companies' designs on the internet. Theirs had awkward proportions; the windows were too high, or there was only one door. I wanted something which let in as much light as possible – hence why I left off the Georgian bars." The excellent customer service offered by the Dunster House team also helped to make her decision an easy one: "They were great and extremely efficient. A couple of queries were answered quickly (by email)." Despite a spell of exceptionally bad weather, even for England, the build was completed in a matter of days. 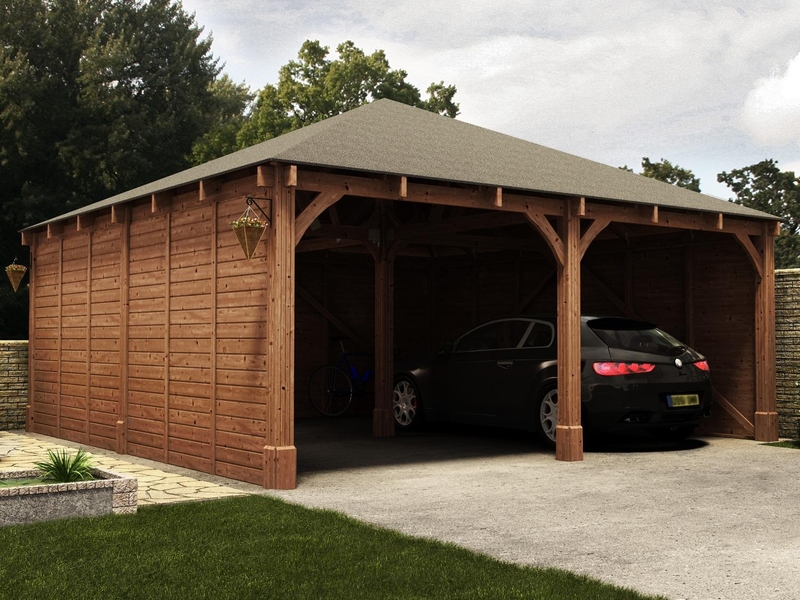 "A carpenter friend put the whole thing together, including a hexagonal concrete base, which he designed himself by drawing around the base and leaving a reasonable width for a step around the edge. 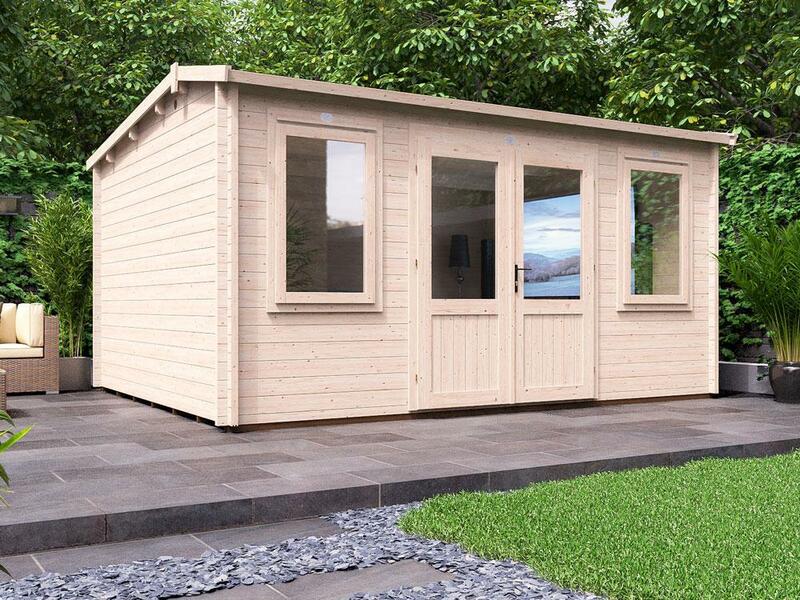 I think this really sets off the summerhouse to its best advantage as it looks part of the design. "The whole construction process took him about 5 days, in between horrendous rain storms (including finishing things like fitting casement catches, taking down the old shed and preparing the base). 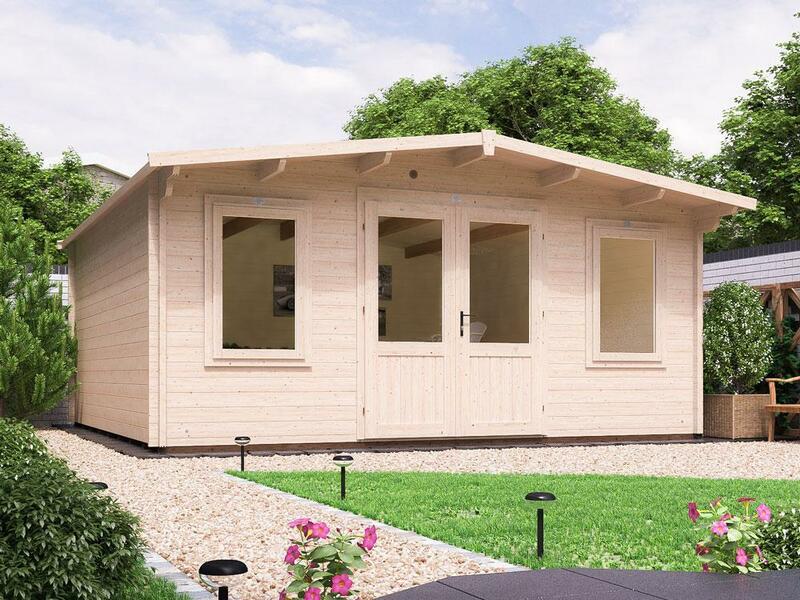 The actual assembly of the summerhouse including the roof shingles, which was quite a time consuming procedure, took about 3 days." The finished product was exactly the escape that Jan had been hoping for – light and airy, with chairs for social gatherings and decorative bunting. "I spent several weekends firstly treating, and then painting the inside and out with 3 coats of paint. I searched high and low for the right kind of furniture and found a wonderful gothic mirror for the middle wall. I found a large circular rush mat on the internet and hung a few bits and pieces around the walls." The envy educing space has gone down a storm with family and friends. 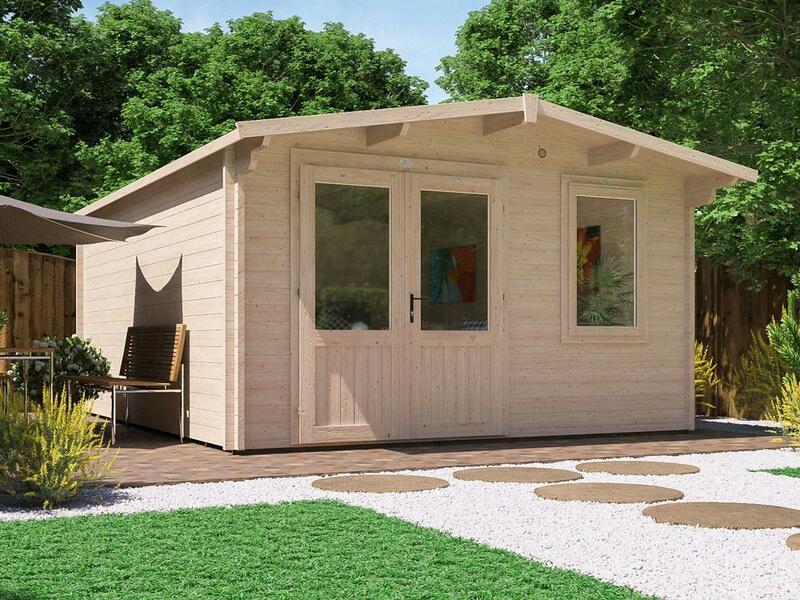 "All fantastic," said Jan on people's comments about the summerhouse. "So many people have commented on it and want one!" "It's perfect. I just love looking at it - even more than sitting in it!" When asked if she would work with Dunster House again, Jan was decisive: "Yes I would. But there is no more room in the garden for anything else!"